No, that’s not what I said! I said, “Ah Tau Kam.” Who is that, you ask? Well, very little is known about him and I could find only a couple references to him on the Internet (now, there is one more). According to the Kamaka Ukulele website, Ah Tau Kam was a contemporary of Samuel Kamaka Sr. (1890-1953) back in the day when Sam Sr. was just starting out. According to the Ukulele Hall of Fame Museum, Ah Tau Kam was one of Samuel Kamaka’s mentors, along with Jonah Kumalae and Sam Chang, both of whom helped Sam Sr. learn the craft of making ukuleles. Inasmuch as Kumalae appeared in the Honolulu City directories as early as 1911, we might guess that the mysterious Ah Tau Kam might have been making ukuleles around that time. 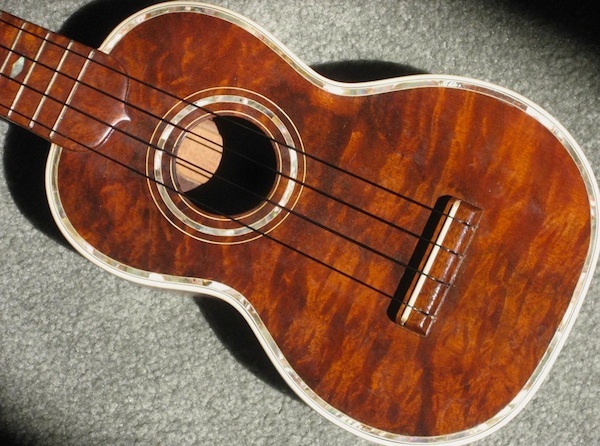 The ukulele pictured here features some extraordinary flame-like quilted koa wood and a wide band of abalone shell inlay next to the white binding on the top, around the sound hole and in the fret position markers. The ornate and elaborate inlay combined with the fancy headstock make it a striking instrument, and it sounds great. For a soprano, it has a wide waist and a large body, similar in shape to some Paul Summers and Sam Chang instruments. The maker’s name appears in the gold decal on the headstock, and it sports the “Tabu” branded stamp on back of the headstock.The item inside the sound hole is a strangely oversized cleat bracing a tightly closed back crack repair. Rarely do we get this kind of detailed history and provenance of an instrument. I hope it’s all accurate; it sure was fun to hear, and I hope you enjoyed it too! I once read that ukulele was the American spelling, while ukelele was the British spelling. Never tried to check it out. Great article. Thanx.